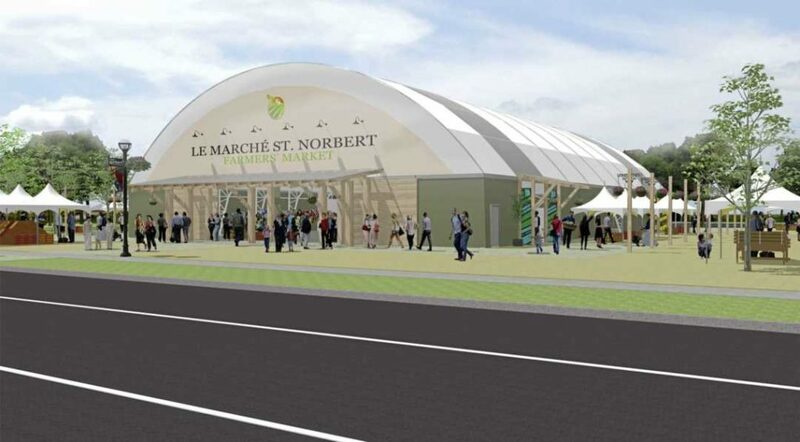 Le Marche St. Norbert Farmers’ Market is in the process of constructing a new canopy structure! While installation has been delayed, the new canopy will be an exciting feature on ‘Main Street St. Norbert’ vs the seasonally removed canvas canopy. The St. Norbert Farmers’ Market will conclude its outdoor season without its eagerly anticipated new market structure and canopy. The installation of the canopy, which was expected to be in use at the market midway through the summer season, has been delayed to mid-November due to backlogs in the City of Winnipeg’s permitting department and an unexpected variance application that has since been appealed. Marilyn Firth, executive director of the St. Norbert Farmers’ Market, said she is disappointed the new canopy did not make it up in time for the summer but the delay didn’t result in any unexpected costs or affect the day-to-day operations of the market. The outdoor market closes on Oct. 28. “It did take much longer than we anticipated to get the permits, obviously,” she said. City councillor Janice Lukes (South Winnipeg-St. Norbert) said building permits that were submitted by the market to the City of Winnipeg in the spring have been stuck in a backlog of applications. A few unexpected caveats on the market lands has further delayed the already bogged down approval process, Lukes added. A required variance for a set back of 39.5 feet instead of 100 feet on the property was approved by the board of adjustment on Sept. 20 but was appealed. The appeal will be heard on Nov. 9 at the appeal committee. The current canopies have a setback of 27 feet, Firth said, and have been that way for years. If the appeal is denied, Firth said permits should be issued shortly after and the market will be able to proceed with building fairly quickly. The entire installation will take two to three weeks. “The weather is starting to close in on us a bit, but they can erect the canopy in any season and it does not take long to put up,” she said. In the meantime, winter markets will be held across the street at the Eagles Club. Firth expects the November markets and first December market will host about 30 vendors, half the number the new structure will accommodate when it’s operational.